Review posted January 29, 2015. Gildan Media, 2013. 7 ½ hours on 7 compact discs. I checked out this book because I’ve been interested in the topic ever since I read Suburban Nation, by Andres Duany, Elizabeth Plater-Zyberk, and Jeff Speck. That book was more about how America should change – this book is more about how America is changing. And it’s mostly good news, I think. Cities are attracting young people, and even outside the city, new construction is designed to be more walkable, more urbanized. I thought my own 26-year-old son was the only young person in the country living without a driver’s license, but it turns out that’s a trend. He lives near the center of Portland and rides public transportation. And more and more Millennials are opting for car-free living. Baby Boomers are ageing, and don’t necessarily want to own a house and yard any more, and the next generation doesn’t necessarily want to buy what they’re leaving. Long commutes have lost their luster, and more and more people are looking for lifestyle changes that don’t necessarily fit with the suburbs. The book is somewhat repetitive and seemed a bit longer than it needed to be. The narrator has a voice that sounds like a teenager, which seemed a little bit of an odd choice. Most of all, it felt ironic to listen to it as I drove through construction, taking almost an hour to get home from work. 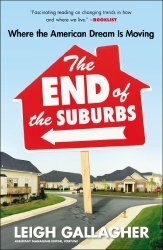 The author did convince me that times are changing, that more people are moving to the cities, and that new construction is going to be designed to be walkable. But she honestly didn’t convince me that the suburbs are really ending any time soon. When I was looking to buy in the suburbs of Washington, DC, I found it’s still true that the most affordable properties are further out. Places like Gainesville, Virginia, are now centers of new construction. But I do think they’re building that new construction to a different model than the one that went before. They are going to look very different from what Baby Boomers think of when you use the word “suburb.” There are lots of townhomes and condominiums available. As stated in the book, developers brag that they are building walkable neighborhoods. So they’re outside the big city, but you’ll still find urbanized neighborhoods, places with a community feel and a town center. Can that be a bad thing? It will be interesting to see how these trends play out.